Beets come in an array of sizes and colors. 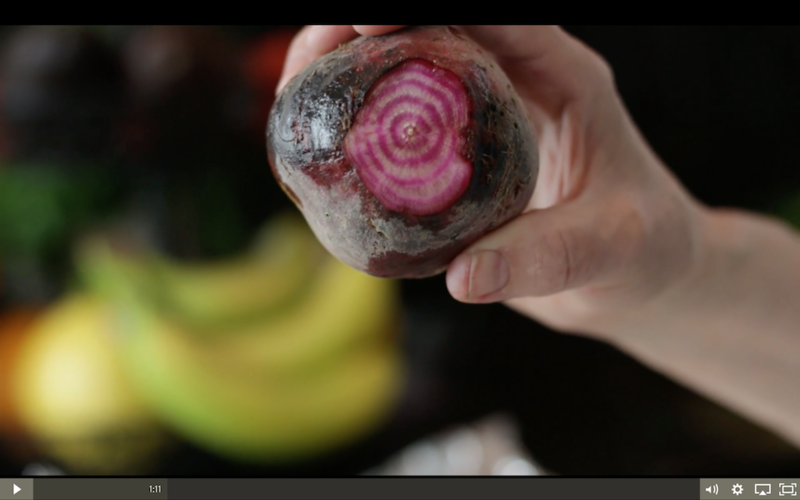 There are a variety of ways to prepare and serve beets: roasting, grilling, boiling, and shredded raw. Today were focusing on roasted beets. The beets I bought had beautiful greens and we’re including a bonus recipe for sautéed beet stems and greens! 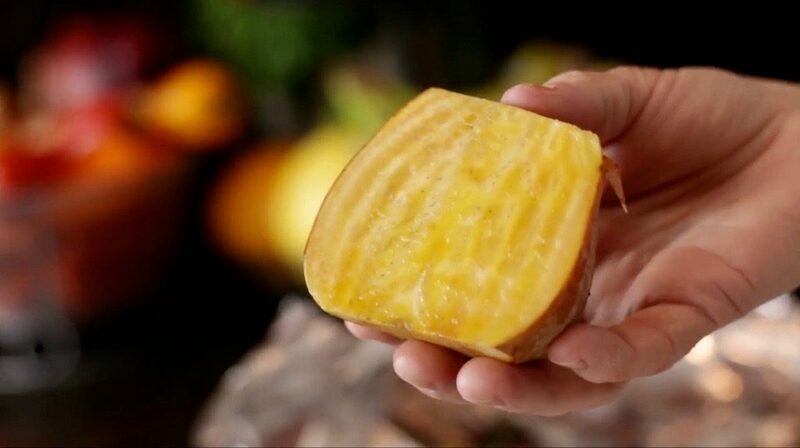 Purchase beets of a similar size for even cooking. Alternatively, cook similar size beets in separate packets. Beets also come in assorted colors, the familiar red beet, candy cane beets – red with white stripes and golden beets. They all taste relatively the same, use the assorted colors to add vibrancy to your dish. Baby beets (teeny tiny bulbs) have delicious greens, just wash the greens and beets and serve with the bulb on. 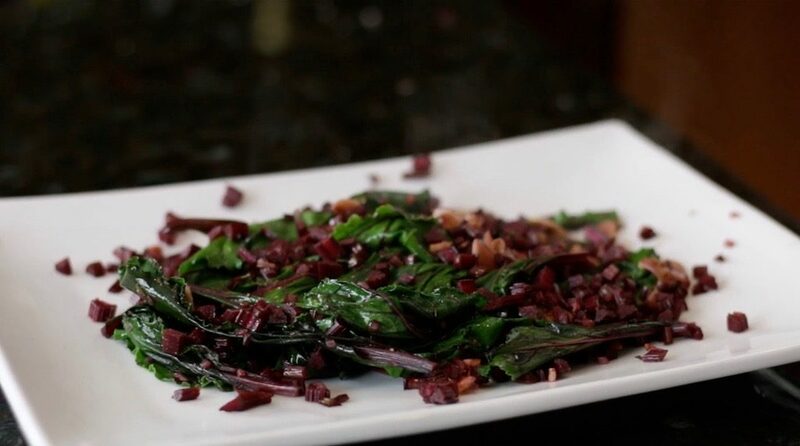 More mature beets have tender greens, just slice the stems away from the bulb and cook separately. Older beets have brown, tough leaves and are less appealing. To clean, remove the stems and leaves from the bulb. Scrub the beet with a stiff vegetable brush and remove the root end. You can either leave the top on or not. Set up heavy duty aluminum foil on your countertop and brush with a little olive oil. 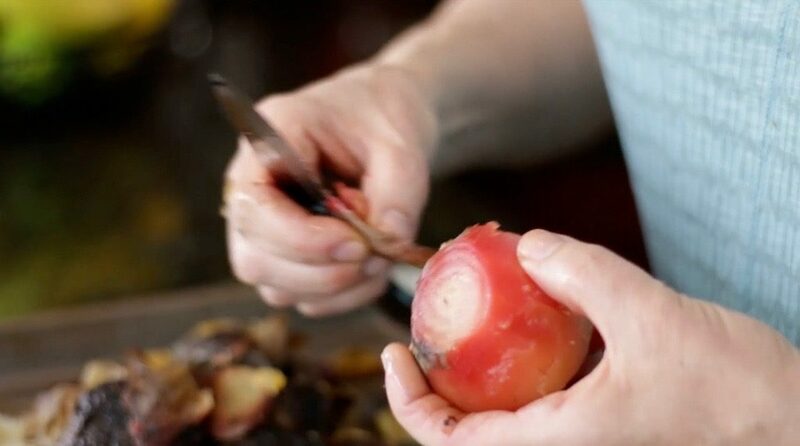 Place the cleaned beets on foil, wrap tightly and roast until fork tender at 400 degrees F. The timing will depend on the size of the beets, small ones 45 minutes, medium 1 hour, larger a little longer. Be sure to package the beets for roasting according to size. Cool and peel. Cut the stems off the beets and thoroughly rinse in lots of cold water to remove any grit; spin dry. Remove the stems from the leaves and mince; keep the leaves whole or chopped. Heat the oil in a skillet over medium-high heat and toss in the garlic, shallots, chopped stems, salt and pepper and cook for 5 minutes. Add 1/4 cup cold water, greens, salt and pepper; cook until wilted.